WhatPhone conducted an online survey in late August 2017. The survey was answered by 500 people. Results were collected immediately afterward and posted to WhatPhone in September. We divided the results between three different articles, based on the questions’ focus areas. The goal of the survey was to assist visitors to the site with information related to common questions we receive on WhatPhone. In general, the first group of questions in the September 2017 survey, paint a lackluster picture of Australian sentiment on the phone company services they buy. It also exposes some common traps visitors get themselves into when they’re comparing phone plans, especially the data component of those plans. 75% didn’t know that, in reality, there are around 50 phone companies in Australia which will provide you a mobile phone service. How can this information help you? : Shop around to find a phone plan which has the features you need. There is plenty of variety out there. The TIO (the Telecommunications Ombudsman) registered a 28.8% increase in complaints about mobile phone services between 2015 and 2016, (the latest available report) with the most common dissatisfiers relating to bills and customer service. How can this information help you? : There are trustworthy telcos out there with customer satisfaction levels much higher than some of the brands with which you are familiar. If you’re disillusioned with the company currently providing your service, leave. There are phone plan options which offer these inclusions, starting at $14 per month. How can this information help you? : Use this as a wake-up call. If you are on an older plan, (i.e. one which does not contain unlimited voice and SMS) it’s time to invest the 15 minutes it will take to change. These survey results seem strongly negative. However, understanding a few key pieces of information offer the chance to dramatically improve things. There are around 50 phone companies in Australia. Shopping around among the best of the alternatives available to you can take as little as 15 minutes. 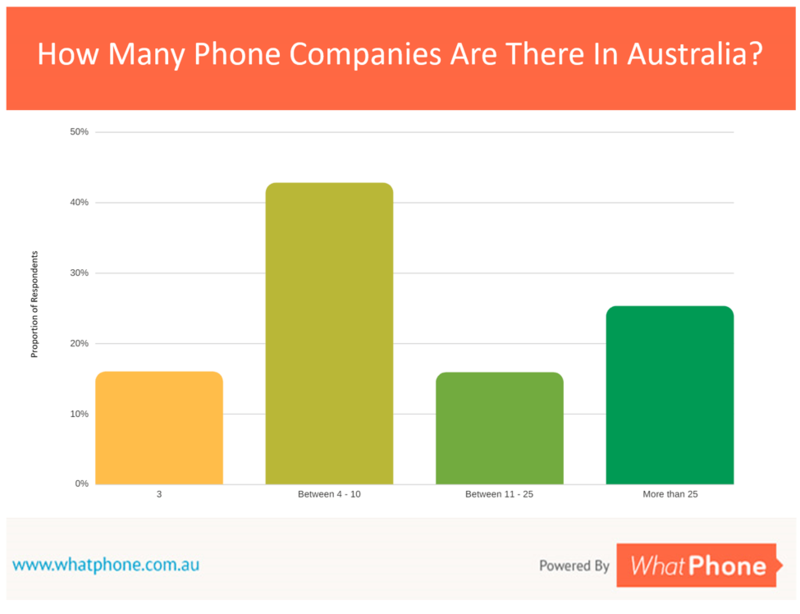 Approximately 25% of people realize that there are around 50 phone companies in Australia. The majority estimated the number of phone company options they have much, much lower. 25% of people think there are only 3 phone companies! This is an important finding. It suggests people are unaware of the number of options they have when it comes to picking a phone plan. Smaller phone companies make up the bulk of the 50 telcos available to you and they often provide better value plus a plan which suits your needs better. The cost structures of small phone companies are different. They tend to offer extremely competitive pricing. The volume of plans available means that you’re more likely to find a plan which suits your specific needs better. Compare smaller phone companies alongside the bigger phone company brands you know. Take Kogan Mobile, for example. This small phone company is one of the most popular telcos chosen by WhatPhone visitors every month. Kogan rents access to the Vodafone 3G and 4G network. Kogan plans offer exactly the same speeds and coverage as you will get if you go directly to Vodafone. Kogan’s customer support is even offered by Vodafone. Around 30% of people have a phone plan which doesn’t include unlimited calls and SMS. There are phone plans with unlimited calls and SMS (in Australia, to Australian phone numbers) starting at $14 per month. Almost any phone plan you buy these days will have unlimited calls and SMS in Australia to Australian numbers. 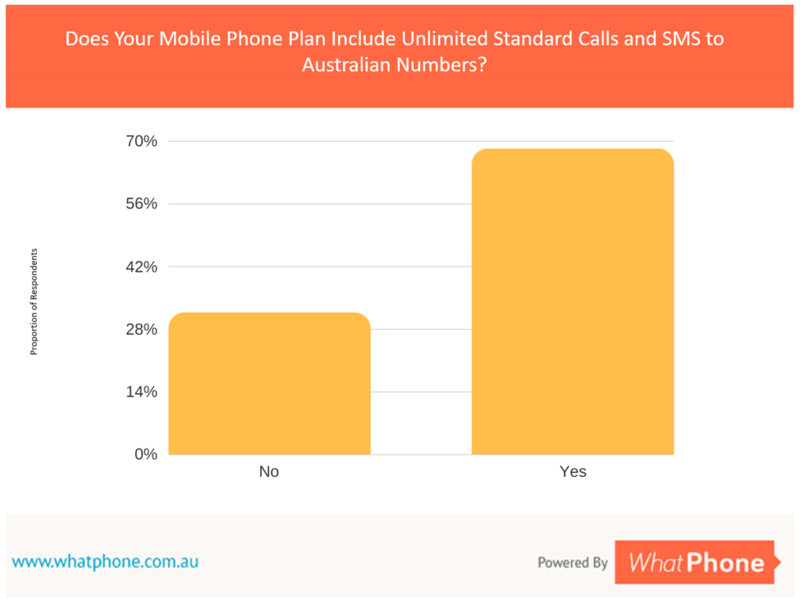 The vast majority of phone plans WhatPhone visitors choose in the last 12 months have unlimited calls and SMS (in Australia, to Australian numbers) included. This survey finding indicates that a substantial proportion of people have not renewed their phone plan in some time. As a result, they are likely to be paying more than they need to for voice and SMS calls. There’s good news as well as bad here. If you have had your phone and plan for some time without checking it, you are almost certainly not in a phone contract with your phone company. That means you can change your plan whenever you want to. Go to our prepaid plans page or our SIM Only page to compare and order a SIM. It will take you 15 minutes, including ordering the SIM on one of our partners’ websites. PAYG (Pay As You Go ) plans do not include unlimited calls and SMS. If you are a very low voice user with a feature phone, PAYG plans can be an even cheaper way to take a phone plan. This is a small cohort of users, however. 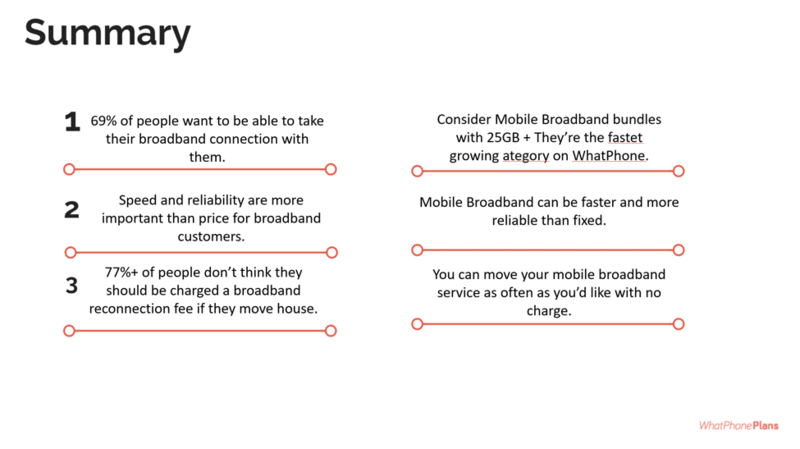 PAYG plans are not a mainstream product. We do not recommend PAYG plans for anyone who uses even a small amount of data in their plan in a usual month. Voice and SMS used to be the main constituents of a phone plan. Now the focus has moved to data. The cheapest of the small phone plans also have small data allowances, usually starting at 1GB. Consider your real data usage. How can I work out how much data I need? 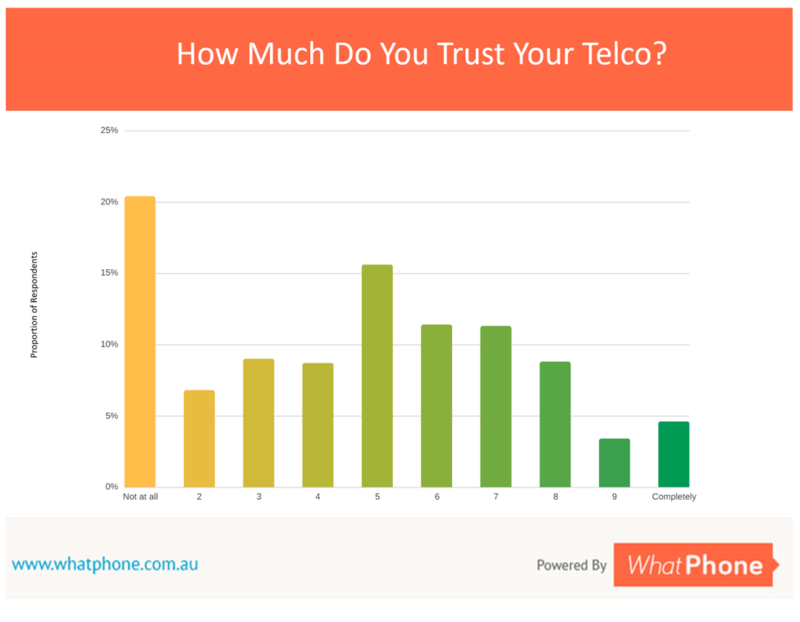 How Much Do You Trust Your Telco? Most common answer ? Not at all. There are phone companies out there who will treat you better if you don’t trust your current phone plan provider. Complaints to the industry regulator (the TIO) suggest that the most likely reasons for this lack of trust are billing problems and problems with customer service. Rest assured, there are phone companies out there who will treat you better. Smaller phone companies regularly come top of the list for customer satisfaction. Some are transparently more reasonable. For example, OVO Mobile who promise to pass on any price cuts to you when they make them. That is a dramatically different promise to the one you’ll get from the main phone companies. To be fair, our survey also indicates that some people trust their phone company a great deal. That’s good news. Trust is a key element of your relationship with any brand and these people are far less likely to want to move to a new phone company when they trust their old one. If these survey results reveal anything, it’s that phone companies and their plans represent a very small component of peoples’ lives. Generally, it appears, people have better things to do than think about the number of phone companies there are out there, and what they offer. The result of that is a large proportion of individuals who are on outdated plans and who don’t trust their telco. Those two things are likely to be related. If it’s a while since you moved your phone plan and you saw better pricing out there or related to you by a friend, you wouldn’t trust your phone company. Thankfully, there are a lot of options and as we say all the time, it only takes a few moments to compare them and buy.